The Victorian Giant Crab Fishery Management Plan specifies the policies and strategies for managing the giant crab fishery in Victoria for at least the next five years. Giant crabs are fished commercially in western Victoria and provide supplementary income for many rock lobster fishers and seafood exporters. The plan sets out arrangements to manage the commercial catch at levels that prevents overfishing, allows stocks to rebuild and reduces the risk of lower stock abundance. This second edition of the Victorian Giant Crab Fishery Management Plan was prepared in accordance with the requirements of the Fisheries Act 1995. Policies and strategies have been updated since the previous management plan for the fishery was declared in 2003 but the management arrangements established in that original plan for the fishery remain in place. A schedule for implementation and an estimate of the resources required to implement this management plan are provided. The purpose of this management plan is to specify the policies and strategies for managing the Victorian giant crab fishery within a framework of ecologically sustainable development for at least the next five years. The first edition of this management plan was developed by The Victorian Fisheries Authority with the assistance of a stakeholder-based steering committee (Department of Primary Industries 2003). This second edition of that management plan was developed after consultation with and agreement from giant crab fishers that changes to the management arrangements established in the first edition were not necessary. Management arrangements that were implemented during the lifetime of the first Giant Crab Fishery Management Plan are not included in this edition. The main aims of this fishery management plan are to manage the commercial catch at levels that prevent overfishing thus reducing the risk of lower abundance and allowing stocks to re-build. Each objective has one or more strategies that are supported by targets, actions and performance indicators. The objectives, strategies and actions of this management plan are summarized in Table 1. A detailed tabulation of the objectives, strategies, actions, performance indicators, targets and corresponding schedules, responsible agencies and estimated costs is included in the section entitled Summary of the Victorian Giant Crab Fishery Management Plan on page 23. Table 1: Summary of the objectives, strategies and actions in this fishery management plan. A more detailed summary is found on page 23 of this fishery management plan. Performance indicators allow progress to be tracked on an ongoing basis and may be refined as additional information obtained from monitoring programs and surveys becomes available. Targets provide longer-term measures for the objectives of the plan and should be achieved through its successful implementation. Existing management arrangements established under the previous giant crab fishery management plan remain unchanged. If a need to alter management arrangements to ensure sustainable use of the fisheries resource or to meet changing demands for recreational fishing opportunities is identified, amendments to this management plan will be considered in consultation with stakeholders and in accordance with the requirements of the Fisheries Act 1995. An annual progress report on the implementation of this management plan will be prepared by The Victorian Fisheries Authority. Progress will be reported against the key performance indicators described in the plan. The annual reports will be provided at an annual management workshop and be made publicly available through the Department of Primary Industries website. This management plan came into effect following the Minister's declaration by notice published in the Victoria Government Gazette and provides the basis for managing the giant crab fishery for at least five years. This management plan will be reviewed by The Victorian Fisheries Authority approximately five years following its declaration and approximately every five years thereafter. Should there be a need for the Minister to amend this management plan prior to its review, amendments will be made in accordance with the requirements of the Fisheries Act. The Victorian Fisheries Authority will fund from its program budget the management plan actions required to meet the objectives of the Fisheries Act. Subject to industry cost recovery and the budget, actions not required to meet these objectives will require that funding be obtained from other sources. Funding sources and estimated budgets for these actions are found in the Summary of the Victorian Giant Crab Fishery Management Plan. The giant crab (Pseudocarcinus gigas) is a member of the family Xanthidae, a group that contains few commercially exploited species. The species is only found in southern Australian waters between central New South Wales and southern Western Australia including Tasmania (Kailola et al. 1993). Giant crabs are slow moving carnivores that feed primarily on sedentary benthic species such as starfish and on carrion. Growth of giant crabs is relatively slow; females and males taking approximately seven years and four to five years, respectively, to reach the legal minimum length of 150 millimetres carapace length. The inter-moult period is one of the longest of the crab species and can be up to fifteen years for mature females (Gardner et al. 2002). Female giant crabs are highly fecund and their ability to store sperm gives them the ability to fertilise their eggs over several successive breeding seasons. Eggs are released during autumn and incubated by the female until the following spring when they are released in the shallower depths of the shoulder of the continental slope (Kailola et al. 1993). In Victoria, female crabs reach maturity at a carapace length of about 125 millimetres. The legal minimum length for females is considered conservative and preserves an estimated 53 per cent of unexploited egg production. Giant crabs inhabit the continental slope, the band of seabed that slopes steeply down from the edge of the continental shelf (the shelf break or shoulder) at approximately 200 metres depth to the deep ocean floor. Giant crabs are most abundant along a narrow zone of the seabed that is dominated by fragile bryozoan communities on the soft muddy banks along the shelf break. Knowledge of these areas is limited; only a small area is mapped and there is little information available on the ecological relationships between giant crabs and other species. The small number of participants in the fishery, a corresponding low level of fishing effort and limited contact by pots with the deep-sea bottom suggest that the impact of this fishery on the ecosystem is low. Figure 1. The Victorian Fisheries Authority vision of success. Fisheries management in Victoria focuses on securing a long-term, high-quality natural resource base and generating jobs and other socio-economic benefits for the State and its communities. The Victorian Fisheries Authority's vision of success is to develop and manage the State's fisheries resources within an ecologically sustainable development framework which ensures fish now and for the future (Figure 1). This vision underpins The Victorian Fisheries Authority's projects, policies and services and is achieved with the cooperation and support of the community, industry and other government agencies and within the established legislative and policy framework. Encourage the participation of resource users and the community in fisheries management. It is important to note that the provisions of fisheries legislation can only be applied to the control of fishing activities. Other human activities that may directly or indirectly affect fish habitats, fishery resources or the quality of fishing may be managed by other government agencies and under a variety of legislation. The detailed management arrangements for the commercial giant crab fishery and other commercial fisheries are found in the Fisheries Regulations 2009 which include licensing and quota management requirements, gear restrictions, catch limits, size limits, closed seasons and closed areas. These principles, Commonwealth guidelines for the ecologically sustainable management of fisheries (Department of the Environment 2007) and the Environmental Protection and Biodiversity Conservation Act 1999 have been taken into account in the preparation of this management plan which has been accredited under part 13 of that Act. Ecosystem-based fisheries management promotes the use of fisheries resources in a manner that does not jeopardise the benefits and opportunities for future generations. It recognises that the users and beneficiaries of fisheries resources are obliged to behave in a way that promotes the sustainability of the resource. Where there are threats of serious or irreversible environmental damage, lack of full scientific certainty should not be used as a reason for postponing measures to prevent environmental degradation (Department of the Environment 1992). The Victorian Fisheries Authority undertakes a risk-based approach to implement ecosystem-based fisheries management so that the highest risks to fisheries and or supporting ecosystems are addressed as a priority, planned for and risks monitored. Under the Environment Protection and Biodiversity Conservation Act, all export fisheries must be assessed against the Guidelines for the Ecologically Sustainable Management of Fisheries to ensure that fisheries are managed in an ecologically sustainable manner (Department of the Environment 1992). The Victorian giant crab fishery has export approval under the Environment Protection and Biodiversity Conservation Act until March 2015 and will be reassessed after that date. Under international law, Australia has exclusive control of all economic resources, including fishing, mining and oil exploration, to a distance of 200 nautical miles from its territorial sea baseline. The division between Commonwealth and state's resources management arrangements within this exclusive economic zone is an important constitutional issue. Under the Offshore Constitutional Settlement with the Commonwealth Government, states generally have responsibility over areas up to three nautical miles from the territorial sea baseline (i.e. coastal waters). Offshore Constitutional Settlement agreements provide an integrated legislative framework for managing commercial fisheries resources that move between the two jurisdictions by conferring management responsibility on Commonwealth or state fisheries management authorities (Attorney-General's Department 2007). The Victorian Government has jurisdiction over the commercial giant crab fishery in the Commonwealth waters adjacent to its coastal waters. Like land-based national parks, marine national parks and marine sanctuaries are protected areas. They safeguard a range of marine plants, animals and habitats in their natural state for the benefit of the environment and current and future generations of Victorians. Victoria was the first jurisdiction in the world to establish an entire system of highly protected marine areas where activities such as fishing, mining of seabed materials and dumping of waste are prohibited (i.e. the National Parks (Marine National Parks and Marine Sanctuaries) Act 2002). This system of parks and sanctuaries protects over five per cent of the Victoria's coastal waters. It is estimated that eight and sixteen per cent of the giant crab biomass within the eastern and western giant crab fishery management zones, respectively, were incorporated into the marine national parks and sanctuaries at their establishment (Hobday et al. 2005). Parks Victoria is responsible for the management of these parks and sanctuaries. Under a service agreement with Parks Victoria, The Victorian Fisheries Authority is responsible for fisheries compliance in these areas. The South-east Commonwealth Marine Reserve Network covers waters between three and 200 nautical miles offshore and extends from the far south coast of New South Wales west to Kangaroo Island off South Australia and includes waters off of Tasmania. The thirteen reserves in the network were declared under the Environment Protection and Biodiversity Conservation Act. The Director of National Parks is the Statutory Authority directly responsible for managing all Commonwealth reserves (including marine protected areas). Arrangements are in place whereby state agencies assist in managing the reserve network (Department of the Environment 2009). A management plan for the South-east Marine Reserves will be developed in accordance with the Environment Protection and Biodiversity Conservation Act. This plan will provide for the protection and conservation of each reserve by setting out how it will be managed, what activities will be allowed or prohibited and how this will be done. It will also set out goals for the reserves and detail strategies to ensure that the natural, social and cultural values of the area are protected. Interim management arrangements will remain in place until a management plan comes into effect. Information relating to fishing activities in the reserve network is available in the Commercial Fisheries User Guide for the Commonwealth Marine Reserves of South-east Australia (Director of National Parks n.d.). The Victorian Climate Change Strategy for Fisheries and Aquaculture 2008-2018 will help to ensure the long term sustainability of Victoria's fisheries resources by guiding activities to support the fishing and aquaculture industries and fisheries managers to prepare for and adapt to the impacts of a changing climate (Department of Primary Industries 2008). Inform reviews of the legislation, plans and policies necessary to sustainably manager our community's fisheries resources within a changing climate. The Victorian Climate Change Strategy is available at www.dpi.vic.gov.au/fishing. The Victorian community owns the giant crab resource and has provided long-term and secure rights to holders of Giant Crab Fishery (Western Zone) Access Licences to access it for commercial fishing. Ownership of giant crabs is transferred to the licence holder when the crabs are taken from Victorian waters and in accordance with the conditions of the fishers access licence. Under this management plan, giant crab fishing entitlements remain based on the legal ownership of Giant Crab Fishery Access Licences and quota holdings as defined in the Fisheries Act 1995 and the Fisheries Regulations 2009. There are two giant crab fishery management zones in Victoria. These zones are discussed in greater detail in the section entitled Fishery management arrangements. The stock of giant crabs distributed along the Victorian coast is part of a larger, genetically homogenous population that is endemic to southern Australia and maintained through widespread larval dispersion. There has been little giant crab fishing in the Eastern Zone so the stocks in that zone are considered to be close to their natural state. Western Zone giant crab catches have declined and there are indications of a spatial contraction in the fishery. 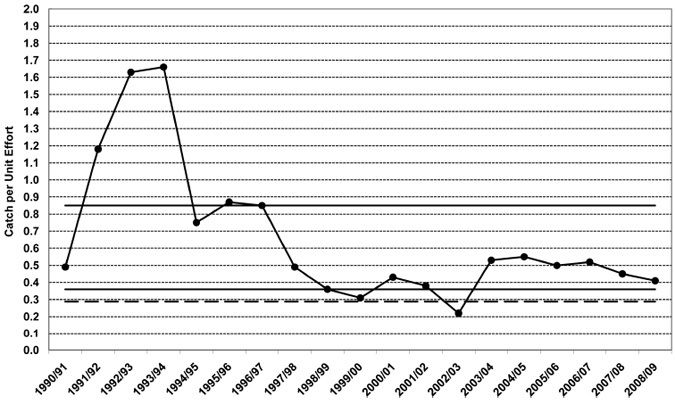 This decline in commercial catch coincided with the introduction of the legal minimum length for giant crabs in 1994-95 and adjustments to the quota management system. The available biomass and egg production has probably been significantly reduced by fishing and the giant crab stocks are considered to be fully exploited. The largest catches to-date in the Western Zone giant crab fishery were during the 1992-93 and 1993-94 quota seasons (April to March1) when approximately 149 and 171 tonnes, respectively, were landed,; between the 2004-2005 and 2008-2009 quota seasons, total catch averaged 21.6 tonne (Figure 2). In the nine years since the 2001/2002 quota season, the current Total Allowable Commercial Catch of 25 tonne has not been harvested; most uncaught quota is the result of small quota allocations attached to inactive access licences. Figure 2. 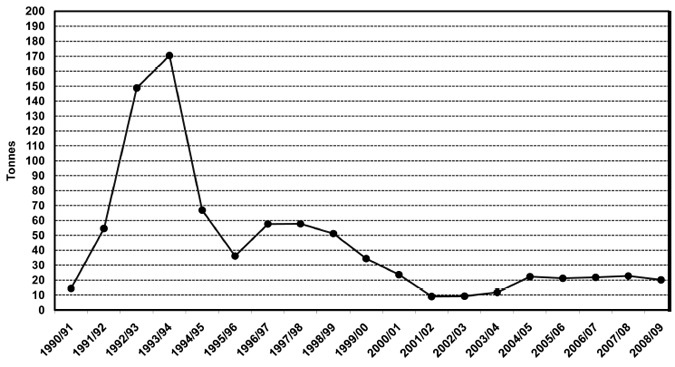 Giant crab catch in the Western Zone fishery during the quota seasons 1990/91 to 2008/09. Coinciding with the highest catches of giant crabs were the highest levels of catch per unit effort: 1.63 and 1.66 kilograms per 24-hour potlift during the 1992-1993 and 1993- 1994 quota years, respectively, for fishers taking more than one tonne of catch. Since 2003-2004, catch per unit effort has fallen from 0.53 kilograms to 0.41 kilograms per 24-hour potlift (Department of Primary Industries 2009). The status of the giant crab stock remains uncertain because of the relatively short life of the fishery and the lack of the comprehensive biological data necessary to undertake quantitative stock assessments. Stocks are, however, thought to be slowly rebuilding under quota management and a conservative legal minimum length. The progressive increase in the mean weight of giant crabs landed during the period 2004-2005 to 2008-2009 and the large number of crabs under the legal minimum length in the deeper shelf break waters are encouraging signs. The giant crab fishery is a small, limited entry fishery closely linked to the rock lobster fishery. In 2008–09, giant crab landings were approximately 20.1 tonnes and valued at around $800,000. Processors and wholesalers who specialise in exporting giant crab have developed technologies to store and transport live crabs to key international markets. Under an Offshore Constitutional Settlement Arrangement with the federal government, the Victorian government has jurisdiction over the giant crab fishery in Commonwealth waters adjacent to Victoria. 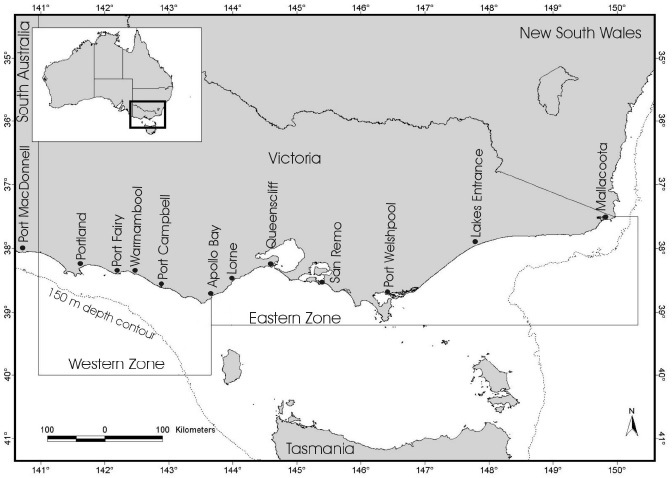 The commercial fishery has two management zones, the Western Zone and Eastern Zone, a division which reflects the zonal boundaries of the rock lobster fishery (Figure 3). The fishery is based in the Western Zone; at the time of writing there was no giant crab fishing in the Eastern Zone. Figure 3. Giant crab management zones and the locations of the main ports for landing. Although the majority of fishers take crab as a by-product of rock lobster fishing, most of the catch in 2008-09 was attributed to fewer than ten operators. Fishers target giant crabs using modified rock lobster pots set at depths of 150 to 300 metres. Holding tanks, seawater sprays and or live wells are used to keep giant crabs alive prior to landing and export. In the Eastern Zone, the giant crab fishery is managed as a developing fishery using general permits and is not under quota management. Although holders of Rock Lobster Fishery (Eastern Zone) Access Licences are eligible for a permit, only a few have been issued. Giant crabs can only be taken by hand or with recreational hoop nets. Due to the offshore distribution and great depths at which giant crabs occur, recreational and customary fisheries for the species do not exist. Due to the complex life cycle and slow growth rate of the species, a commercial giant crab aquaculture industry for the species has not developed in Australia. Table 2. Key elements of the giant crab (Western Zone) fishery. Key elements of the Western Zone giant crab fishery are summarised in Table 2. In 2001, the Western Zone giant crab fishery changed from an input to an output managed fishery with a limited number of commercial access licences (i.e. the Giant Crab Fishery (Western Zone) Access Licence), a quota management system and individual transferable quota units. At the time of writing, there were thirty Giant Crab Fishery (Western Zone) Access Licence holders and 500 quota units for the fishery. In 2008–09 the Total Allowable Commercial Catch was 25 tonnes and each quota unit was equivalent to 50 kilograms of giant crab. Key elements of the Western Zone giant crab fishery are summarised in Table 2. Other fishery management controls include minimum size limits, restrictions on taking berried females, closed seasons, area closures and limits on pot numbers and fishing gear. A Giant Crab Fishery (Western Zone) Access Licence can only be operated when it is linked to a Rock Lobster Fishery (Western Zone) Access Licence. As a giant crab access licence does not, under normal circumstances, have a pot entitlement, licence holders use the pot entitlement of the linked rock lobster access licence to take giant crabs within their quota allocation. A maximum of two operators can be named on a Giant Crab Fishery (Western Zone) Access Licence provided they are also nominated on the linked Rock Lobster Fishery Access Licence. The same boat may be specified on multiple giant crab access licences so that multiple licences may be operated from one boat. A licence holder may apply to vary the licence conditions relating to the operator(s) and boat(s). Giant crab fishery access licences and quota holdings are linked but may be traded independently within the fishery. Quota units in the giant crab fishery can only be owned by giant crab access licence holders and there is no maximum or minimum number of quota units that can be attached to a licence. Quota units may be transferred permanently or for a quota period. Licences are issued for one year and must be renewed prior to expiry in order for the licence holder to commence fishing at the start of a new quota period. Licence holders will not receive a quota notice for a new quota period until their licence is renewed. Licences which are not renewed, are cancelled by a Court or are removed from the fishery through other mechanisms, such as amalgamation, will not be replaced. Rock Lobster Fishery Access Licence holders who do not have a Giant Crab Fishery (Western Zone) Access Licence or the appropriate general permit may not land giant crabs. The incidental take of giant crabs in other commercial Victorian fisheries is not permitted under the giant crab quota management system. Ports and moorings at which giant crab catches can be landed are specified in the Fisheries Regulations. Before entering any of these ports or mooring areas, giant crab fishers must record in their daily catch record book the number of giant crabs caught and report this information to the Department of Primary Industries using the integrated voice response (IVR) system. After landing, the catch must be weighed and reported using the IVR system within twenty minutes. Catch disposal records must be completed before any giant crab catch is sold or taken from the place of landing. Daily catch records must be submitted monthly to the Department of Primary Industries. Some Giant Crab Fishery (Western Zone) Access Licence holders may acquire more giant crab quota than can be efficiently fished on the more distant giant crab fishing grounds using their rock lobster pot entitlement. Giant crab licence holder with more that sixty giant crab quota units are authorised to use additional pots in depths greater than 150 metres. The number of additional pots authorised is up to the pot entitlement of the linked rock lobster fishery access licence so long as the total number being worked from any one boat does not exceed 140. The additional pots are not transferable; fishers wishing to increases their deeper water pot entitlement may only do so by increasing the pot entitlement of the linked rock lobster licence. The authority to fish additional pots in deeper waters ceases and the pots are removed from the fishery if the licence holder's quota holding falls below sixty units. The number of additional giant crab pots that can be used by the holder of a Giant Crab Fishery (Western Zone) Access Licence is specified on the licence. Giant Crab Fishery (Western Zone) Access Licences can be disassociated from Rock Lobster Fishery Access Licences and put into abeyance. A Giant Crab Fishery Access Licence that is in abeyance does not have an operator or boat specified and cannot be fished until it is again linked to a Rock Lobster Fishery (Western Zone) Access Licence. Giant crab fishery access licences that are in abeyance are subject to annual renewal fees. The carapace length of giant crabs is, for regulatory purposes, the straight line distance from a point between the eyes to the opposite point at the rear of the carapace. The legal minimum length for female and male giant crabs is 150 millimetres carapace length; to manage the available and spawning biomass, this measure is reviewed during the Total Allowable Commercial Catch setting process. Giant crabs are caught commercially with baited rock lobster pots. A pot can have only one entrance and one chamber. Each pot must have at least one escape gap designed to allow undersize rock lobster and giant crab to escape. Specifications for rock lobster pots are found in the Fisheries Regulations. A closed season is a period during which the take, attempt to take or possession of a species is prohibited. The primary reason for the giant crab closed season is to protect female crabs during the spawning season and to prevent the use of pots during the closed season for rock lobsters. The closed season for female and male giant crabs is from 1 June until 15 November and from 15 September to 15 November, respectively. There is a total year round prohibition on the retention of berried females. Victorian giant crab fishers must land their catch in designated Victorian ports. Subject to approval by The Victorian Fisheries Authority, giant crab fishers may land their catches in Port MacDonnell, South Australia or in Eden, New South Wales. Licence holders must apply each year for this authority. The Victorian Fisheries Authority will continue discussions with Tasmanian fisheries managers regarding arrangements for landing Victorian giant crab catches in Tasmanian ports. The Eastern Zone giant crab fishery will continue to be managed as a developing fishery; Rock Lobster Fishery (Eastern Zone) Access Licence holders may apply for a General Permit to operate in the fishery. Consistent with the management of other developing fisheries, specific permit conditions relating to the area of operation, fishing gear, reporting requirements and operating procedures will be developed on a case-by-case basis. Fishing effort for giant crabs in the Eastern Zone has historically been low due to low abundance and there are no permits currently issued for the fishery. In the event of an expansion in fishing effort, reporting requirements that support the collection of information needed to assess the status of the fishery and to determine if a commercial fishery warranted will be specified in a permit. Permit requirements will likely reflect fishery management arrangements currently in place for giant crab fishing in the Western Zone. Management arrangements for the Victorian giant crab fishery are accredited for export under the Commonwealth Environment Protection and Biodiversity Conservation Act 1999 until March 2015 when the fishery is due for reassessment. Catch per unit effort is the primary indicator of giant crab biomass and is measured by the weight of the catch taken per 24-hour pot lift by fishers landing greater than one tonne of giant crabs in the quota year. This stock abundance indicator is easily understood, available from existing monitoring programs and is used in current stock assessments. Other indicators that will be taken into account include catch size composition and the proportion of the Total Allowable Commercial Catch that is taken by licence holders and biological information such as growth, reproductive characteristics and mortalities. These factors will be considered where the Total Allowable Commercial Catch is not caught and trends in catch per unit effort and size indicate the need for management action. Changes in size composition may reflect trends in mortality and or recruitment but interpretation of the data will consider changes in fishing practices and trends in catch per unit effort. The ratio of the annual catch to Total Allowable Commercial Catch can be influenced by factors that are independent of the fishery status including quota trading, markets and fishing practises. Giant crab stocks will be maintained at or above minimum biologically acceptable levels as defined by limit and target reference points (Table 3; Figure 4). In the Western Zone, the limit reference point is the mean catch per unit effort for the period 1998/99 to 2000/01 (i.e. 0.36 kilograms per 24hour potlift); the target reference point is fifty per cent of the peak catch per unit effort between 1990/01 and 2000/01 (i.e. 0.85 kilograms per 24-hour potlift). Where the performance measures increase to or fall below a pre-determined level, specific management triggers and actions are specified. Trends in stock indicators and the views of stakeholders at the Total Allowable Catch Forum are considered in making recommendations and fishery management decisions. The status of the giant crab resource in Victoria is reviewed at the annual Stock Assessment Workshop organised by The Victorian Fisheries Authority and involving all stakeholders. The workshop is the principal means by which stakeholders are informed of the biological condition of the giant crab fishery and have input into the evaluation of stock status. The annual Total Allowable Catch Forum provides stakeholders with the opportunity to have input into the total allowable catch- setting process. This forum is moderated by independent chair and is open to Giant Crab Fishery Access Licence holders, representative bodies, observers and The Victorian Fisheries Authority staff. Table 3. Summary of stock indicators, reference points, performance measures, triggers and management actions used in the giant crab (Western Zone) fishery. Note: 'Review the total allowable catch' means to consider the management implications of maintaining, increasing or decreasing the total allowable catch or varying input controls. Figure 4. Catch per unit effort (kilograms per 24-hour potlift) for fishers landing more than one tonne of giant crab in a licensing season. Horizontal solid lines represent the target (upper) and limit (lower) reference points. The horizontal dashed line is the trigger point for the limit reference point. The Total Allowable Catch Forum makes recommendations to the Department of Primary Industries which will prepare management advice including draft quota orders, size limits and closed seasons (Figure 5). Following further consultation with industry, the Executive Director The Victorian Fisheries Authority will determine the Total Allowable Commercial Catch for the coming licence year. Final quota orders are published in the Victoria Government Gazette. Biological research and monitoring improves fishery manager's understanding of giant crab stock dynamics and provides a basis to evaluate alternative management arrangements including developing better indicators of stock status and maintaining fishery-independent surveys. There are currently no biomass estimates for the giant crab resource. A length-structured model, similar to the rock lobster stock assessment model used in Victoria, is being developed in Tasmania under a Fisheries Research and Development Corporation-funded project on which Victoria is collaborating. Further work is required, including updating growth data from Victorian tag recaptures, before the model becomes a reliable predictor of giant crab biomass in the Victorian fishery. Figure 5. TACC setting and fisheries management workshop processes. Catch per unit effort will continue to be the main biological indicator for the health of the fishery. As part of a scientific review of catch per unit effort as a stock indicator, The Victorian Fisheries Authority with assistance of a Resource Assessment Group involving fishery managers, fishery scientists and industry representatives, will determine the most appropriate method of standardising it. The appropriate use of fishery management tools is critical to ensure that stock biomass is built and maintained at biologically sustainable and economically efficient levels. All management tools will be, over the life of this fishery management plan, reviewed as required. In reviewing management tools, The Victorian Fisheries Authority will note the need to provide certainty for operators to plan their business activities. Escape gaps will continue to be used in pots to minimise by- catch of undersize rock lobsters and giant crabs. Undersize giant crab and berried females caught in pots should be quickly returned alive to the sea near the habitats where they were caught. As discussed on page 20, a code of practice developed under this fishery management plan will include recommendations for appropriate practices. Discard rates will continue to be monitored by onboard observers and taken into account during stock assessments. Industry will monitor means, including changes to pot design, to reduce giant crab mortalities. Threatened, endangered and protected species that may be encountered in the Victorian giant crab fishery include cetaceans (i.e. whales and dolphins), seabirds, marine turtles, seals, syngnathids and great white, grey nurse shark and whale sharks. Under the Victorian Wildlife Act 1975, the Flora and Fauna Guarantee Act 1988 and the Fisheries Act 1995, interactions with protected wildlife are an offence and may be subject to prosecution. The Department of Primary Industries and the Department of Sustainability and Environment have an agreement whereby operators fishing in Victorian waters under the authority of a Giant Crab Fishery Access Licence and the prescribed management arrangements for the giant crab fishery are not prosecuted for incidental or unintentional interactions with protected species provided the interactions are reported (Department of Primary Industries 2007). A similar agreement exists for interactions in Commonwealth waters. Incidental interactions with protected species must be reported by operators using the Protected Species Interactions form contained in the Giant Crab Daily Catch Record Book. Several species of marine invertebrates and fish including octopus, draughtboard sharks, wrasse and leatherjackets and hermit, sand and velvet crabs are taken as by-catch in crab pots (Hobday et al. 2008). Some by-catch is used as bait or sold. Monitoring by on-board observers has shown that fishing- related interactions and mortalities of by-catch species are low, due in part to the use of escape gaps and return to the sea of by-catch alive. Hobday et al (2008) reported that the level of by-catch by the giant crab fishery is low and unlikely to impact on the sustainability of non-target species. The onboard observer program will, if necessary, continue to enable ongoing assessment of the impacts of the fishery on non-target species. Climate change is a strategic priority for action by the Victorian Government. The Victorian Climate Change Strategy for Fisheries and Aquaculture 2008-2018 will help to ensure the long term sustainability of Victoria's fisheries resources by guiding activities to support the fishing and aquaculture sectors and fisheries managers to prepare for, and adapt to, the impacts of a changing climate (Department of Primary Industries 2008). Research information obtained under the strategy will assist Victoria's fishing and aquaculture sectors to manage their own exposure to climate change risks and to successfully meet the challenges and opportunities ahead. The strategy will also be used by the Victorian Government to inform reviews of the legislation, plans and policies necessary to sustainably manage our community's fisheries resources within a changing climate. Under this fishery management plan, current administrative arrangements relating to the transferability of access licences, quota units, pot holdings and entitlements and determining the Total Allowable Commercial Catch remain. Licence holders may apply to vary their access licence conditions relating to the operators, boat and pot entitlements. Up to two operators can be named on a Giant Crab Fishery Access Licence. A boat may be specified on more than one access licence which allows multiple licences to be operated from it. Giant Crab Fishery Access Licence holders sell their catch to commercial fish processors, wholesalers and retailers. Giant crab buyers in Victoria are not required to have a fish receivers licence. As there does not appear to be a significant compliance problem with giant crab receivers, this management plan does not recommend licensing receivers and processors. If new information is identified during annual compliance reviews, this arrangement may be reviewed. The separation of quota entitlements from fishery access licences has potential to enhance quota trading, investment and industry development. Other initiatives such as a web- based quota trading system could improve the transparency and effectiveness of that market. An important objective of this plan relates to industry profitability and the ability of the industry to reach optimal economic efficiency. 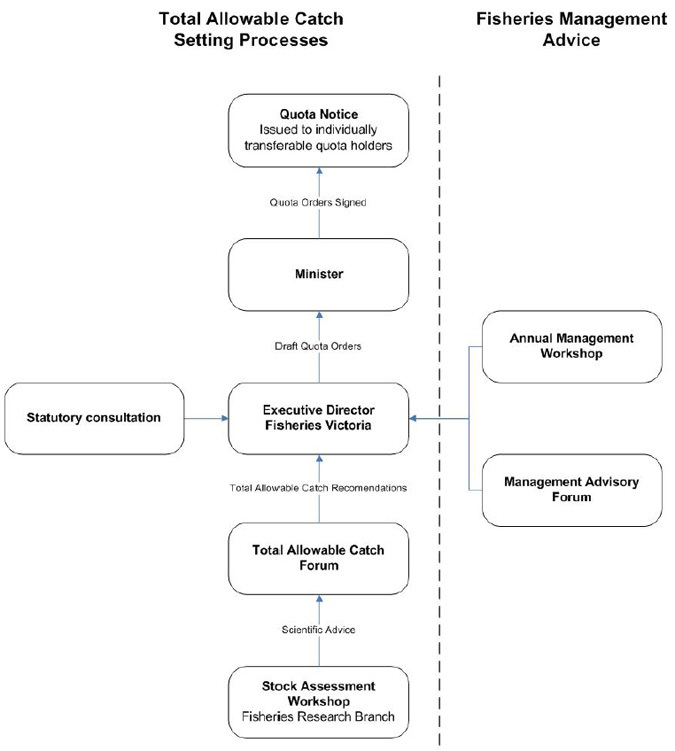 Financial performance of the fishery, particularly in respect of the effects of management and the decision framework for setting Total Allowable Catch, is regularly monitored and the information obtained considered when catch limits and other management arrangements are discussed. Routine monitoring of the financial performance of the industry or the individual operators is not currently undertaken. Within the first year of this management plan, the giant crab industry and The Victorian Fisheries Authority will undertake an economic survey and analysis of the fishery and develop indicators of economic and financial performance. These indicators will be used to inform future management decisions. The Fisheries Cost Recovery Standing Committee will advise the Department of Primary Industries on an appropriate cost sharing arrangement for economic performance monitoring for the fishery. As most giant crabs caught in Victorian fishery are exported live to Asia, it is essential that the fishery maintains its export accreditation under the Commonwealth Environment Protection and Biodiversity Conservation Act 1999. The previous giant crab fishery management plan was an accredited management regime and the fishery was granted an exemption from the export control provision of that legislation until March 2015. The Victorian Fisheries Authority will submit this management plan for reassessment under the Environment Protection and Biodiversity Conservation Act. As the industry is a major beneficiary of export approval, subsequent re-assessments will be the responsibility of industry. The Victorian Fisheries Authority will facilitate, on a case-by-case basis, strategic proposals by industry to improve its marketing capability providing that management of the resource is not compromised. During the life of this management plan, an overarching code of practice that documents and demonstrates the methods employed by the giant crab industry to operate in an environmentally and socially sustainable manner will be developed. This code of practice will incorporate sound biosecurity practices that may include encouraging the industry practice of using endemic species for bait to prevent the introduction and translocation of exotic species and diseases. The code will also incorporate strategies to minimise entanglements with threatened, endangered and protected species. Co-management, an integral feature of contemporary fisheries management, is an arrangement whereby the responsibility for resource management is shared between the government and user groups (Sen and Neilsen 1996). The Department Primary Industries is committed to comanagement and effectively engaging stakeholders in decision-making. DPI will continue to consult with stakeholders through the annual Fishery Management and Stock Assessment Workshops and the Total Allowable Catch Forum which will continue to provide authoritative input into the quota-setting process. In accordance with the principles of cost recovery, Giant Crab Fishery Access Licence holders will continue to contribute to the cost of fishery management, compliance and research through an annual levy imposed at licence renewal. The levy is determined through the Regulatory Impact Statement process following advice from the Fisheries Cost Recovery Standing Committee. Research and development supporting this fishery management plan will focus on providing information for managing and developing Victoria's giant crab fishery within a framework of ecologically sustainable development. In addition, The Victorian Fisheries Authority is involved in regional climate change studies, the outcomes of which may have relevance to the giant crab fishery. To facilitate expansion of and co-investment in research and development projects, The Victorian Fisheries Authority will consult with relevant stakeholders to develop research priorities that help to support the giant crab fishery. Funding for giant crab research and development has in the past been provided mainly through The Victorian Fisheries Authority, the Fisheries Research and Development Corporation and relevant stakeholders. As competition for limited research and development funds increases, projects are becoming larger, more strategic and requiring multidisciplinary approaches. Greater emphasis on efficient and effective use of research and development resources, collaboration to enhance capability, demonstration of the benefits of research and development and expanding the funding base are required. Successful fisheries management in Victoria depends heavily on achieving high levels of compliance with legislation. This is best achieved by maximising voluntary compliance and creating deterrent strategies. The Victorian Fisheries Authority will review the current compliance strategy for the giant crab fishery and focus on the primary threats identified during a formal compliance risk assessment and will include targeted operations based on intelligence reports. The review of the compliance strategy will consider a cost- benefit analysis of using vessel monitoring systems and other new technologies more broadly for compliance in the giant crab fishery. The previous giant crab compliance strategy was established following the introduction of quota management to the fishery. While there was a need at that time to educate giant crab fishers using landing inspections, the quota management system is now well understood and compliance operations will be based on intelligence reports and risk assessments. Under this management plan, The Victorian Fisheries Authority will prepare annual compliance reports for the giant crab fishery which will be presented and discussed at the annual management workshop. High levels of voluntary compliance require effective education and compliance programs to promote awareness and understanding of management objectives and strategies and a sense of shared responsibility for maintaining healthy fisheries for future generations. Industry, in consultation with The Victorian Fisheries Authority, will develop an education and communication strategy for the giant crab fishery during 2011-12. Attorney-General's Department 2007, The Offshore Consitutional Settlement. Attorney-General's Office, Canberra. Retrieved on 25 August 2010 from www.ag.gov.au. Department of Primary Industries 2003, Giant Crab Fishery Management Plan. Fisheries Victoria Report Series. Report No. 2. Department of Primary Industries, Melbourne. Department of Primary Industries 2007, Protected Species Action Plan. Department of Primary Industries, Melbourne. Department of Primary Industries 2008, Victorian Climate Change Strategy for Fisheries and Aquaculture 2008-2018. Fisheries Victoria Report Series. Report No. 66. Department of Primary Industries, Melbourne. Department of Primary Industries 2009, Giant Crab Stock Assessment. Fishery Stock Assessment. 9 November 2009. Department of Primary Industries, Melbourne. Department of the Environment, Water, Heritage and the Arts 1992, Intergovernmental Agreement on the Environment. Canberra. Retrieved on 25 August 2010 from www.environment.gov.au. Department of the Environment, Water, Heritage and the Arts 2007, Guidelines for the Ecologically Sustainable Management of Fisheries. Department of the Environment, Water, Heritage and the Arts, Canberra. Department of the Environment, Water, Heritage and the Arts 2009, South-east Commonwealth Marine Reserves Network. Canberra. Retrieved on 25 August 2010 from www.environment.gov.au. Director of National Parks n.d., Commercial Fisheries User Guide for the Commonwealth Marine Reserves of South-east Australia. Department of the Environment, Heritage, Water and the Arts, Canberra. Gardner C, Jenkinson A, Heijnis H 2002, Estimating intermoult duration in giant crabs (Pseudocarcinus gigas). In 'Crabs in Cold Water Regions: Biology, Management and Economics'. (Edited by AJ Paul, EG Dawe, R Elner, GS Jamieson, GH Kruse, RS Otto, B Sainte-Marie, TC Shirley, D Woodby). Alaska Sea Grant College Program, Anchorage, Alaska. Hobday D, Punt A, Smith D 2005, Modelling the effects of Marine Protected Areas (MPAs) on the southern rock lobster (Jasus edwardsii) fishery of Victoria, Australia. New Zealand Journal of Marine and Freshwater Research 39, 675- 686. Hobday D, Reilly D, Flint R 2008, Monitoring of by-catch and interactions with threatened, endangered and protected species in the Victorian southern rock lobster and giant crab fisheries. The Victorian Fisheries Authority Research Report Series. Report No. 39. Department of Primary Industries, Melbourne. Kailola P, Williams M, Stewart P, Reichelt R, McNee A, Grieve C 1993, Australian Fisheries Resources. Bureau of Resource Sciences and the Fisheries Research and Development Corporation, Canberra. Sen S, Neilsen J 1996, Fisheries co-management: a comparative analysis. Marine Policy 20, 405-0418. The following Ministerial guidelines for the Giant Crab Fishery Management Plan were published in Gazette G 32 on 8 August 2002. I, Candy Broad, Minister for Energy and Resources, issue the following guidelines with respect to the preparation of a Management Plan for the Victorian giant crab Fishery in the western zone. The Victorian Fisheries Authority will be responsible for the preparation of the Management Plan. The Fisheries Co-Management Council will oversee the process of preparing the Management Plan, in consultation with the relevant Fishery Committees. The Plan will define the process for reviewing management arrangements for the fishery including the total allowable catch (TAC), size limits and closed seasons. The Plan will take account of Environment Australia's guidelines for assessing the ecologically sustainable management of fisheries. The Plan will address the need to define a threshold limit for the total allowable catch (TAC) above which mechanisms such as auctions, tender or ballot should be considered for the allocation of increases in the TAC. The Plan will address issues relating to pot limits in the giant crab fishery under an ITQ system. The Plan will be consistent with the Victorian Government Response to the National Competition Policy (NCP) Review of the Fisheries Act 1995, released in December 2001. The Plan will review the relationship between a Giant Crab Fishery Access Licence and a Rock Lobster Fishery Access Licence, and the prohibition of using giant crab pots in waters less than 150 m depth. The Plan will review the 50 pot zone within the western zone known as the 'Apollo Bay paddock'. From 2011, the quota year will be from July to the following June. To accommodate this change, the 2010-2011 quota year commenced in April 2010 and will finish at the end of June 2011.